Face reads: "The Hollerith Electric Tabulating System Patented 1889" "A close perusal of the counter will show a magnet with an armrature. 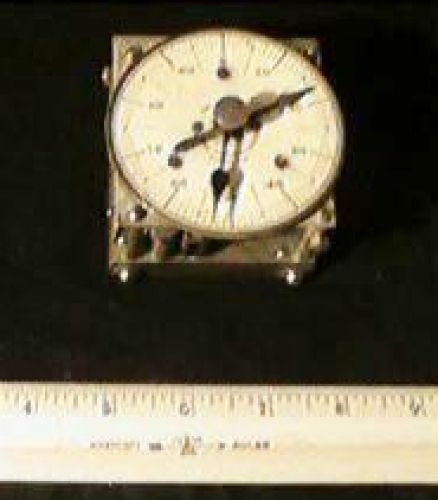 At the movable end of this armature, seen at the top and the rear of the counter, is a pawl which operates against the ratchet teeth of a gear. Len Shustek writes: The 1880 census used 1500 clerks to produce 21,000 pages in 7 years. There was real danger that the 1890 census would take more than 10 years, violating the constitutional requirement for a census every 10 years. The census bureau established a competition for better technology. A young engineer named Herman Hollerith won the competition. He was inspired by railroad conductors' "punch photographs" the recorded physical description to keep track of who had paid. 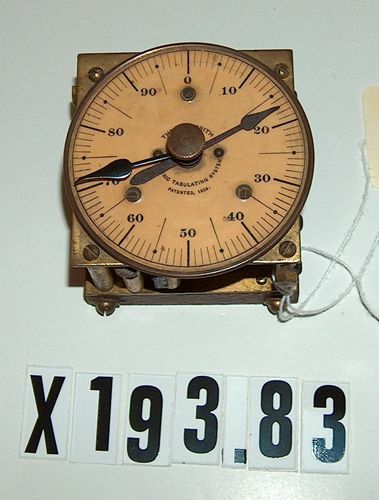 He proposed manual card punch with mechanical counting on dials. It used card the size of the dollar bill, so that drawers and storage bins were available. For the 1890 census 62M cards were punched (700/clerk/day) and counted by 100 of Hollerith's census machines (1000 cards/hour/machine). They used pin presses with mercury cups underneath to make electrical contact to move the dials. The sorting compartments had lids that flipped open to show where to put the card. Mechanics were on duty to fix machines, and the trouble was often that somebody had extracted the mercury from one of the little cups and dumped it into a spittoon just to get some extra rest time. It took only 2+ years to complete 26,000 pages ? a great success. But Hollerith had one customer who buys every decade, so had almost no business after the census and was down to four employees. He incorporates TMC (Tabulating Machine Co.) in 1896 to sell business- oriented machines, but had to gear up again for the 1900 census. By 1911 he had 100 customers and wasn't even doing the census anymore. It merged with Computing Scale Co. and Int'l Time Recording Co. to form C- T-R (Computing-Tabulating-Recording) Co. In 1911 Thomas J Watson joins, and Hollerith retires as a wealthy entrepreneur. In 1924 the company name was changed to IBM, and the rest is history.